There are many different stories about the beginning of the Olympics. One myth says that Zeus, the supreme god of the Ancient Greeks, started the Games to celebrate his victory over his father Cronus for control of the world. Another tradition says that after the Greek hero Pelops won a chariot race against King Oenomaus to marry Oenomaus’s daughter Hippodamia, he established the Games. The first official ancient Olympic games took place in 776 BC and since then they were held every four years. During the games all Greeks respected an agreement called “Sacred Truce”. According to this agreement, the entire region of Olympia was proclaimed sacred, and military forces were banned from its soil. 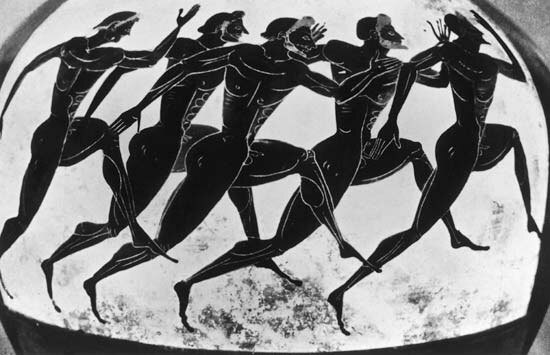 The first Olympic games included only a footrace. 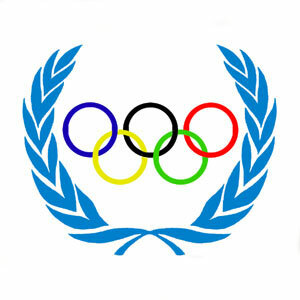 The pentathlon and wrestling were the first new sports to be added, in the 18th Olympiad. There were rules about who could compete in the Olympics. Anyone who was free-born Greek could take part. Barbarians, slaves and women were not allowed to compete. Not only that women were not permitted to compete, married women were also barred from attending the games under penalty of death. However, not married women were allowed to attend. But, women had their own competitions in that time. The most important was a maidens’ footrace in honour of the goddess Hera. There were 3 separate races for girls, teenagers, and young women. The winners received olive crowns. The winners of the Olympic games also received olive crowns, but beside that, they had their statue set up at Olympia. The winners were treated almost in the same way as today’s sports stars. They had free meals at public expense, best places in theatres and were celebrated by the people of their community. Besides benefits for the best athletes, there were some penalties for those who broke the established rules. There were judges who decided which punishment was suitable for each offence. All kinds of cheating were punished. Bribes were one of the most common. They were also fined for avoiding the compulsory training period at Olympia and for cowardice. The Ancient Olympic games were held for the last time in 393 AD, since the Byzantine emperor Theodosius I forbade their celebration after this time. It took more than 15 centuries for the Olympic games to be revived in 1896 in Athens.